Two years ago I put my back out and was down for almost a month. It was a long hard month (especially because my hubby was working out of town). Luckily for me I had a teenage driver that ran everyone around and kept milk in the fridge, teenage girls that kept the house going and watched the younger ones, and meals in the freezer so we didn't have to eat Mac and Cheese every night. My family and friends were also great to help out! During this time I realized that there were some areas I hadn't taught my kids enough. One of these areas was doing laundry. I'm kind of fanatical about my laundry and up until hurting my back, I was the only one allowed to do laundry. I know....dumb! My hubby had ruined too many of my clothes at the first of our marriage won thru incompetence and I had banned him from the laundry (there are many things he does GREAT in the house - laundry just isn't one of them). 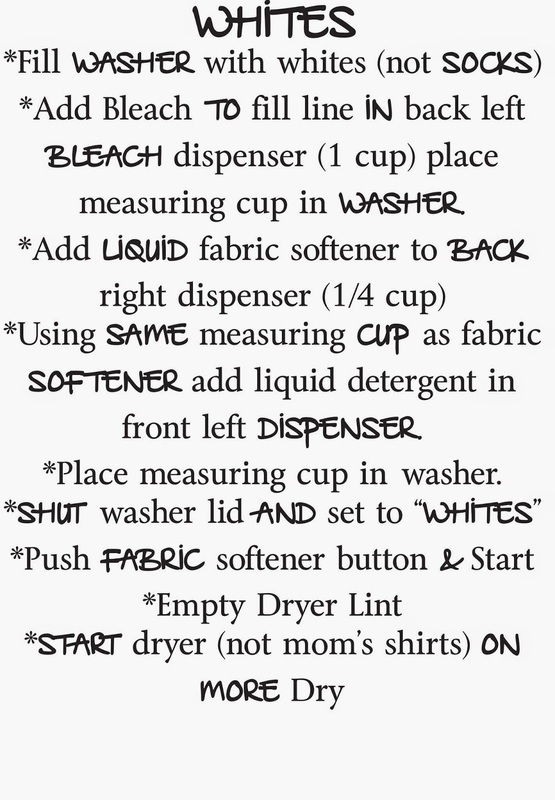 In order to help them, I made detailed instruction sheets for the different loads of laundry they would be doing. I later framed these and hung them by the washer. After dealing with back pain (two herniated discs) for 18 months, the past 3 months I have been pain free - I forgot how nice it was to not have back pain. Well, it all ended last week. Not sure what I did, but I've been down for the past 10 days. Everything has gone back on my kids and luckily my hubby this time too! My older kids have been doing some of their own laundry the past 2 years but usually just their own. 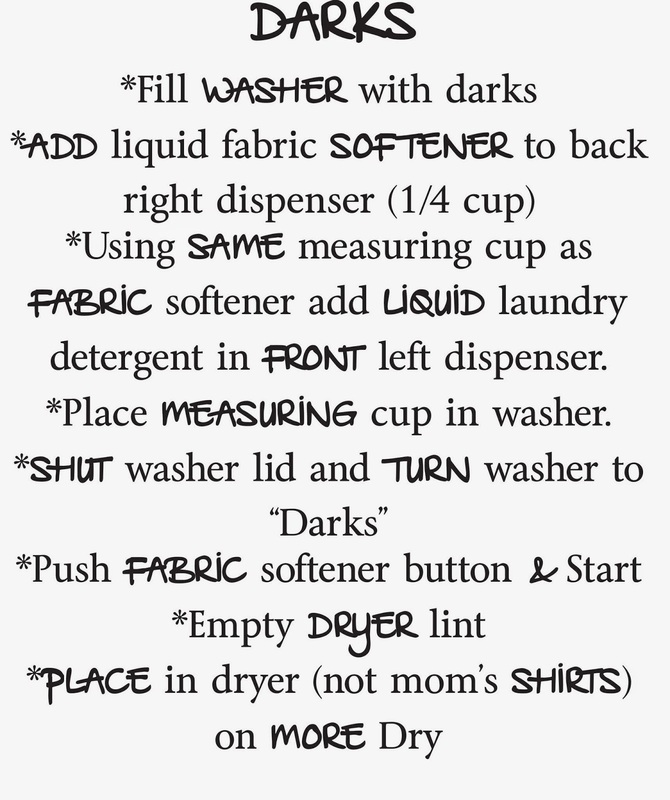 My mom came over to help do some laundry and asked if she could just follow the instructions on the wall (not that she doesn't know how to do laundry, just wanting it to be how I like it). 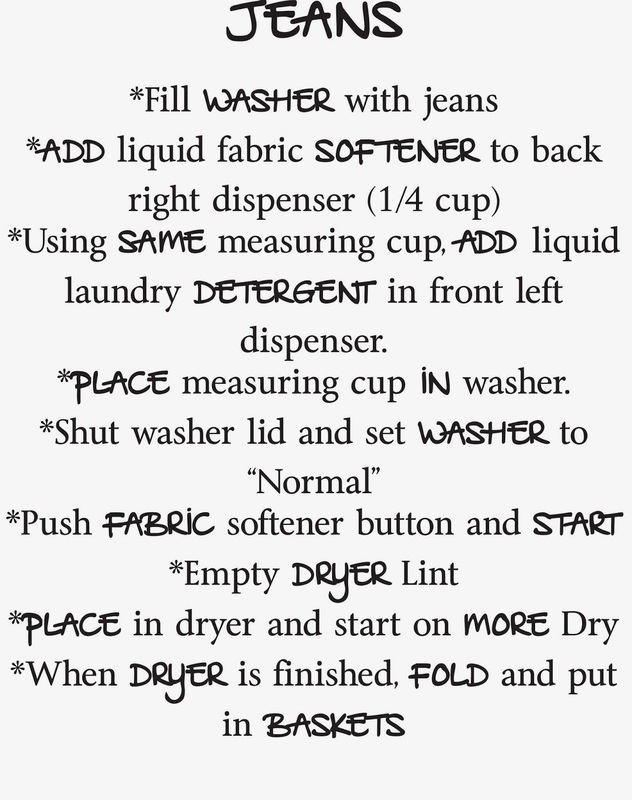 Oops....we got a new washer last year and none of the instructions are right. 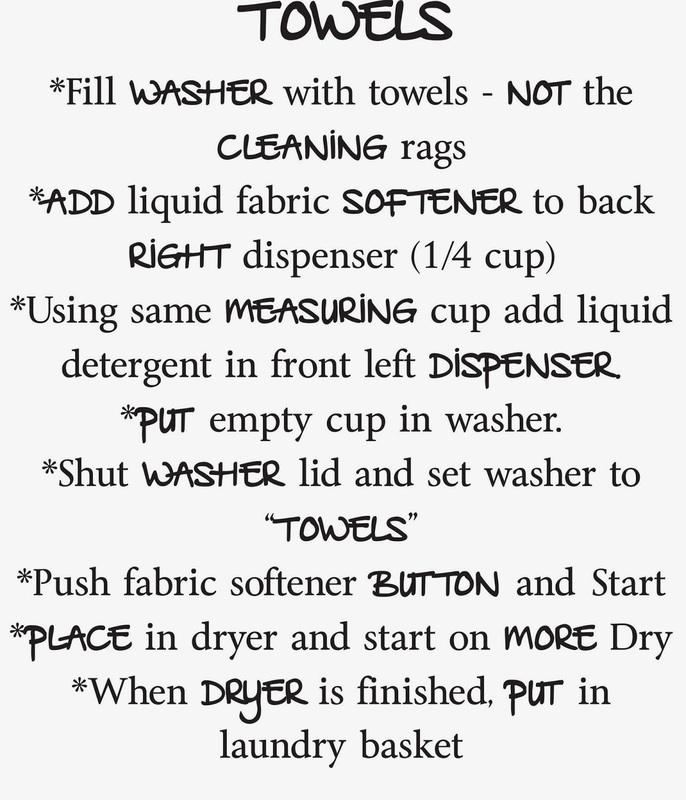 So after trying to walk her through step by step, (I also decided I'm picky about laundry - no wonder I do most of it) I decided I needed to update my instruction sheets. 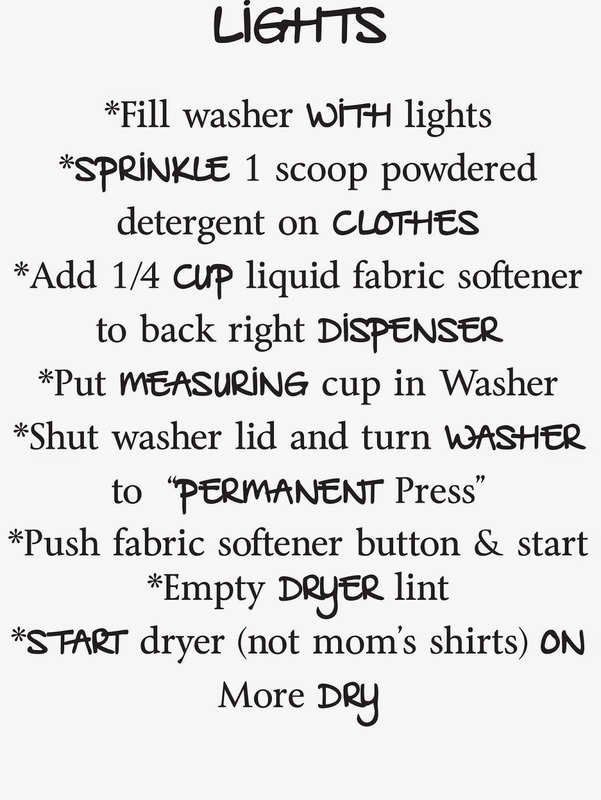 Unless you make your own homemade dry laundry soap and homemade liquid laundry soap and have the same washer as me, these instructions probably won't work exactly for you, but it may give you an idea. My 11 year old has been asking to help with laundry lately (you know how everyone else's jobs look funner than your own). I was planning on having her help out this summer so I could walk her through stuff...but it looks like it's going to be sooner than I thought. I do my laundry in many different loads. My mom is fanatical about laundry (more so than me), and I remember her being so appalled when my brothers friend said he did all of his laundry together. He didn't see what the big deal was, pretty soon everything matched! I do darks, lights, towels/sheets, jeans, cleaning rags (microfiber cloths-no fabric softener), and whites are separated into 3 different loads, socks, baseball pants and all others. I pre-soak all the white socks in Oxy Clean overnight, and then wash with bleach. My youngest plays on a little league team and a tournament/travel team. For some reason the boys think it's really cool to slide and end up with the dirtiest pants... I live in Southern Utah and the red dirt is crazy to get out. Red Dirt and White Baseball Pants Don't Mix! I used to soak and scrub, soak and scrub, and then a little more soaking and scrubbing (or beg him to wear black baseball pants - with not much luck, they're much hotter). Of course the one time I want him to get really dirty, he doesn't even slide. I have since found a great product to get rid of the red dirt & it's so easy too, no scrubbing at all! It's called Iron Out. It's sold in the cleaning products, usually by the toilet cleaners. It's also used to remove rust. I don't know how it works on "normal" dirt, but on Southern Utah's RED dirt it's awesome! I put his pants in a bucket and cover with HOT water and then pour 1 cup of Iron Out powder on them. I let this soak overnight. In the morning I put them in the washer and run them thru a quick wash cycle - Iron Out and bleach don't mix! Then I run them through my normal whites cycle and they are perfectly clean. Without a scrub brush or any elbow grease from me! It will bleach out any stitching, but hasn't bothered the black stripe on his pants. 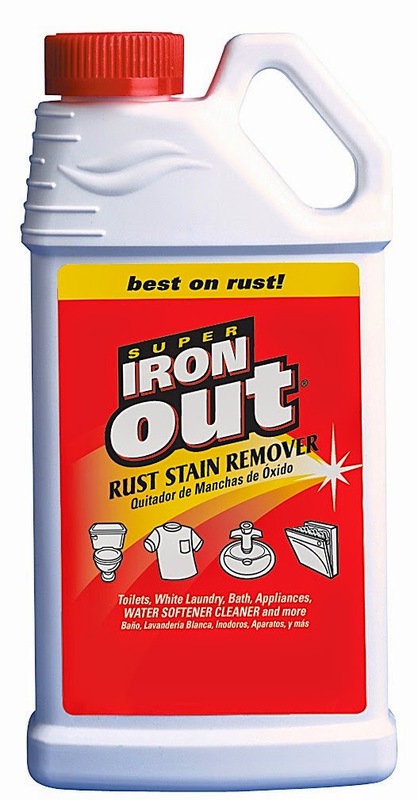 ***FYI-Iron Out is not meant for colors! My son had spilled some hot chocolate on his school choir t-shirt and then stuffed it in a drawer. Well, since they only use these a couple times a year, it sat for 4 months before I discovered it. I decided to put it in some iron out and see what happened. His aqua colored shirt, is now purple. Oops! Stick with whites for Iron Out!